Casino is the perfect theme for your New Year's Eve party. It has built in entertainment (gambling) and the best decorations. So combine the glitz of the casino with the glamour of New Year's Eve for the perfect celebration to ring in 2016, Vegas Style! You'll want to send a fantastic invitation to your casino party. 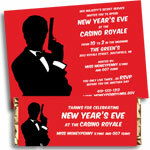 A Personalized New Year's Casino Invitation is a great option! Be sure to send your invitation 6 to 8 weeks in advance as New Year's is such a popular holiday. Make your own invite by cutting hearts, diamonds, spades, and clubs from black and red cardstock. Write your party info with a white paint marker on the front. A handful of poker confetti in each envelope is a nice touch. A great way to make the invitation stand out from the rest is to send along a few poker chips in the envelope. Can't decide? 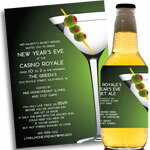 Choose one of our many New Year's party invitations for your casino extravaganza! Welcome everyone with a Personalized Casino Banner outside your house (waterproof!) wishing all a Happy New Year. When your guests walk in the door greet them with a life-sized cutout of you dressed in swanky clothing. Add a speech bubble telling guests to don their party hats and tiaras. A casino decorating kit is an easy way to decorate your whole venue! For a stunning (yet inexpensive) effect, hang a combination of Card Dangles and Black and Silver New Year Danglers from your ceiling. Fun! Create signs telling people where they can play different casino games. A New Year fringe banner over the buffet or bar for a final celebratory touch. It is very important to decorate your guests for a New Year's Eve party, whoever had a bad time when they were wearing a fun hat and tooting on a horn? The easiest way to get everyone dressed up is with a New Year's Eve Party Kit that has hats, tiaras, noisemakers and more! Personalize Your Party! Another fun New Year's party idea is to pass out Personalized Money at the door. Let your guests use it to bet on games and redeem prizes at the end of the night! You don't want to serve a big meal at this party. Just circulate tasty appetizers and h'ordeuvres. Make sure you have some fun Casino Paper Goods to go with the food. Cover any tables, the buffet and even the bar with Blackjack Table Covers, they make unique tablecloths. Since everyone will be eating on the go, make silverware bundles by wrapping plastic utensils with a napkin. Tie the bundles off with colorful Dice Beads. Your guests can wear them as a favor after they eat! Red roses are the perfect color for a casino party. Fill a vase with dice and have a small bouquet of roses placed on the top of the vase. Balloons, as always a great for a party. Choose red, black and green, of course, with metallic casino balloons. A small slot machine (you can find toys online) is great on a table as a centerpiece. Keep it simple with a casino centerpiece kit. Come with everything you need to make your tables pop! A slot machine scene setter is an easy way to decorate an entire room! Once you choose your centerpiece, you may want to scatter dice, mini playing cards or poker chips around the table for a bit more fun! Wow your guests by serving drinks in light up champagne glasses, they will be the hit of the party. A good way to add a bit of festivity to the bar is to use a fun cocktail or beverage napkin along with a few creative drink garnishes. Try this classy card beverage napkin paired with a olive in your martini. Fabulous! You can always pop a few of these fun LED ice cubes in each glass for a some glow! Personalize Your Party! This is a New Year's party, so don't forget to toast and celebrate with lots of bubbly! Make it extra special by using Personalized Champagne Bottle Labels that match your invitations on the bottles. Send your guests home with a bunch of casino themed treats. Don't forget favor bags! Check out these custom New Year's Eve favor bags. Personalize Your Party! 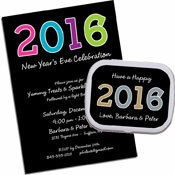 Even if your guests don't "win" anything, make sure they go home with a sweet reminder of your New Year's party. A Personalized New Year's Casino Candy Bar fits the bill!